Electronic cloth take-up systems synchronized with the electronic let-off motion have a positive influence on fabric quality. Different weft densities can be programmed, depending on the pattern. The KAST-ERGO fabric take-up is used to keep the required thread density in the fabric. The electronic system saves important time as the required pick density can be set electronically and no change of pick wheels are required. The KAST-ERGO control optimizes the weaving procedure and simplifies the operation. It can be used either as a warp let-off or as a combination of warp let-off and fabric take-up. A regular weave structure and a high fabric quality can be achieved through the interaction of warp let-off and fabric take-up. The control unit can be used for any kind of weaving machines. The KAST-ERGO warp let-off allows to control up to four warp beams fully independently or in a synchronized mode. It ensures that warp tension is maintained precisely from the full to the empty warp beam. The settings makes it easy to adjust the pick density of the fabric for optimum fabric weight and minimum yarn consumption. The interaction of warp let-off and fabric take-up is an indispensable prerequisite for high quality fabrics. 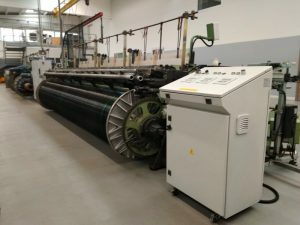 The external control panel can be mounted at weaver’s desired position and offers the advantage of manual operation for warp let-off and fabric take-up.